As a product of the keenly motivational energy mentioned above, I am sharing this little infographic I made. 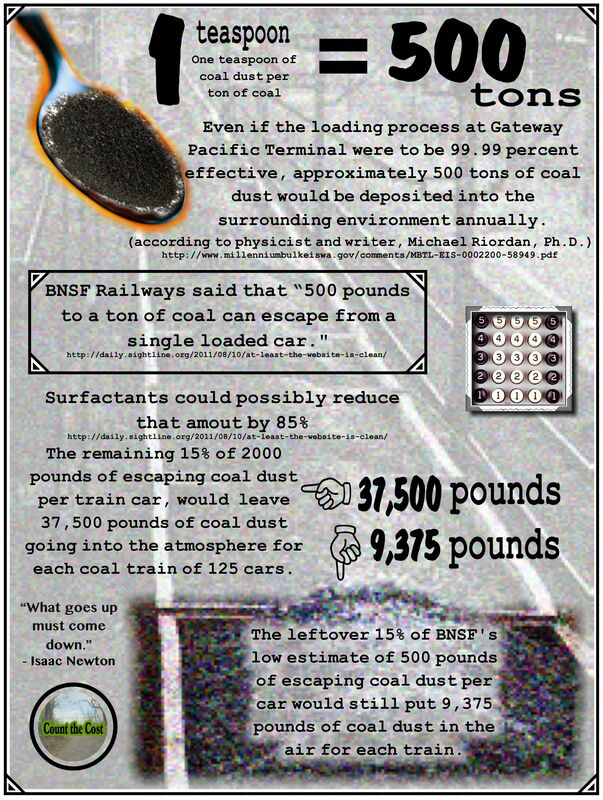 It was also inspired by Lummi Indian Business Council (LIBC) member, and protector of the Salish Sea, Jay Julius’ statements (quoted in a number of articles from 2013 to 2014) regarding the deeply disturbing amount of coal dust that would be deposited into the waters and surrounding environment at Cherry Point, even if the 48 million ton Gateway Pacific coal terminal were operating at 99.99 percent efficiency. (My gut response to that percentage being met on any consistent level is, “Fat chance!”) Please feel free to use and share this graphic liberally. To me, my little infographic is the hopeful representative of a kick-off to more infographics, mine and others’, big and little. I am also hopeful that it is a symbol and starter of little conversations and growing dialogues. I earnestly believe that it is through such inaugural discussions between family members, neighbors and other individuals in the community that one by one, one on one, by way of people they trust and care about, people are able to get the impact and call to action presented by the simple facts and dire threats surrounding the growing number of proposed fossil fuel projects in our country, and in our local and beloved communities here in the Pacific Northwest. FYI, I had someone make this remark to me today, in case it is of interest: You should take a look at the number of coal cars parked behind 1111 W Holly Bham.